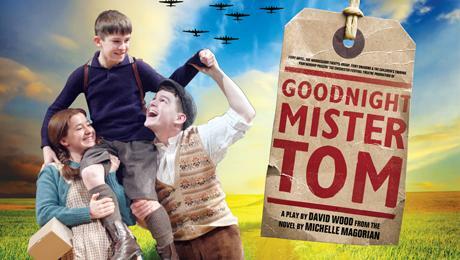 The producers of Chichester Festival Theatre’s production of Goodnight Mister Tom are delighted to announce that the Oliver award-winning stage adaptation of Michelle Magorian’s classic novel will embark on a UK Tour in 2016 after its strictly limited West End run at the Duke of York’s Theatre this Christmas. The production will open at Manchester Opera House and continue on to Milton Keynes Theatre, Glasgow Theatre Royal, Birmingham New Alexandra Theatre, Oxford New Theatre, York Grand Opera House, Richmond Theatre, Aylesbury Waterside, Woking New Victoria, Bath Theatre Royal, Cambridge Arts Theatre, Cardiff New Theatre and Newcastle Theatre Royal. Six talented young performers have been cast in the key roles of William and Zach. Joe Reynolds, Freddy Hawkins and Alex Taylor-McDowall will alternate the role of William and Sonny Kirby, Harrison Noble and Oliver Loades will alternate as Zach. Angus Jackson leads a stellar creative team that includes designer Robert Innes Hopkins (Oppenheimer; RSC/ West End), lighting designer Tim Mitchell (King and Country: Henry IV Part I And Part II; RSC/ Barbican) and sound designer Gregory Clarke (The Boy in the Striped Pajamas; Chichester Festival Theatre & Children's Touring Partnership). They are joined by composer Matthew Scott (Taken at Midnight;Chichester Festival Theatre/ West End), puppet maker and director Toby Olié (associate puppetry director of War Horse; West End) and choreographer Lizzi Gee (Future Conditional; Old Vic).